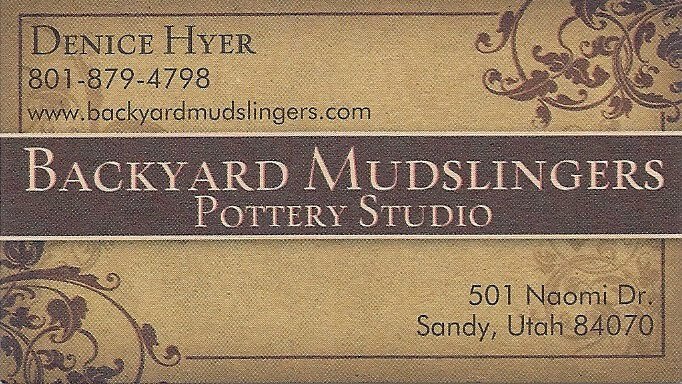 Backyard Mudslingers Pottery Studio: Remember Me? Hi all. No I haven't disappeared from off the face of the earth. I've been busy, just like you. But now that the girls are back in school and my vacations are over I should have a couple uninterrupted hours a week to spend in the studio. Doesn't that sound divine? 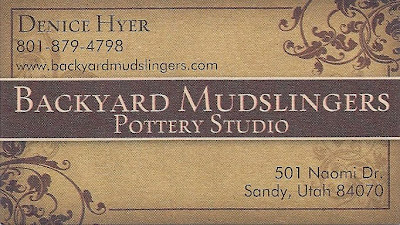 I thought I'd real quick show you my new business cards and then go get to work. Of course since it's been so long since I've posted anything my real quick has turned into awhile and cut in to my studio time. Good thing I have a lot of patience. (That should have made a couple of you laugh, maybe just Brian). Enjoy your day! It's good to have you back! Hope you enjoyed the vacations. Sorry you were so close and we missed you!